If your senior loved one spends a lot of time in one room, such as a bedroom or family room, it can feel small and confining very quickly. Sometimes because of injury, illness, surgery or the effects of old age, they may choose to pass the majority of the day in a recliner or a bed, with only trips to the bathroom to provide a change of scenery. Family caregivers like you can do a lot to make sure this main room is a lot more enjoyable for them. When people are surrounded by a warm atmosphere, it greatly helps their mental health. 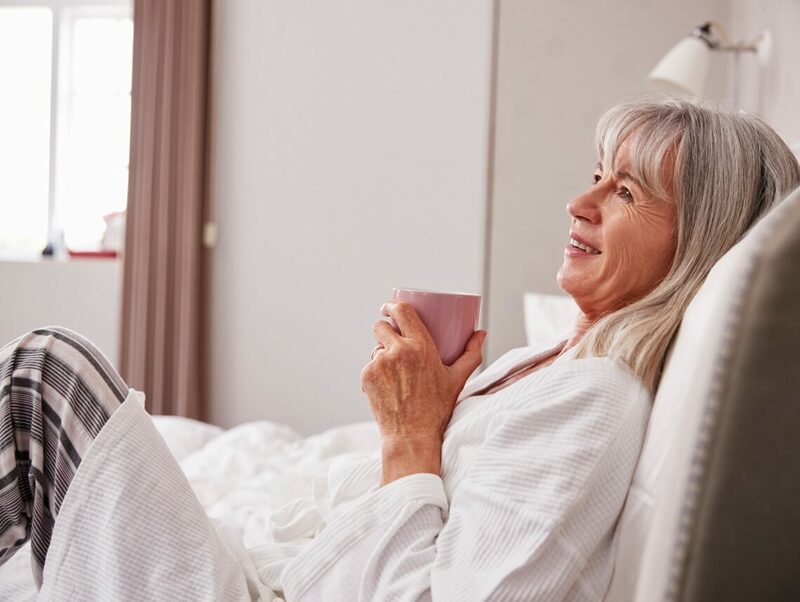 Here are 5 things that you can do to make a bedridden senior’s room more enjoyable. It’s easy to overlook clutter and dust when there is so much going on, but frequently used rooms really do need a deep clean every few weeks. Not only will a good cleaning reduce particles and dust in the air, but it will smell fresher and look better. Bring in attractive containers, baskets and totes to store items so that dressers, shelves and tables are free of clutter. It’s easier for seniors to feel more relaxed in a room with clean lines and minimal stuff. There are few things that can liven up a room better than houseplants. Not only are beautiful houseplants pleasing to look at, but houseplants can also boost the air quality in a room. By absorbing certain gasses in the air and putting out oxygen, plants can actually clean the air. Indoor air pollution can lead to a number of illnesses and health problems in seniors like asthma, allergies, headaches, nausea and more. Some of the best indoor plants that clean the air and look great include Boston ferns, spider plants, snake plants, waxed begonia, English ivy and some varieties of orchids. Just like any other room in the house, the main room that your senior loved one will be staying in can benefit from a fresh new look with new décor. A mini-makeover can include new pieces, or pieces from elsewhere in the house that are favorites. From family photos to paintings to vacation mementos, beloved items can make a dull room shine. Dedicate one shelf or tabletop to seasonal décor so that your aging loved one can enjoy different decorations that celebrate various holidays and times of the year. It doesn’t matter whether the outside view is a backyard, busy street corner or something in between because the window can be a way for bedridden seniors to enjoy the outside world. You can set up a bird feeder or flower pot just outside the window to attract birds, bees and butterflies. Hanging flower baskets, stained glass, or sun catcher ornaments and wind chimes can all add a touch of beauty that can be seen from indoors. Nowadays there are so many interesting entertainment options such as gaming systems, satellite TV, video streaming services and even satellite radio. Bedridden loved ones can be in control of everything as long as they know how to operate the remote controls to each device. Print out clear instructions for them to follow and they’ll be able to access a world of entertainment whenever they choose to.